Synthetic mulches, especially black plastic film, effectively suppress most weeds, thereby reducing labor and other costs for weed control. Synthetic mulches can also improve growing conditions for the crop, and thereby improve crop competitiveness against weeds. Black plastic promotes crop growth and earliness by increasing soil temperature. Clear or translucent films warm the soil to a greater degree, but do not suppress weeds as effectively. Red, blue, white, and reflective mulches are occasionally used to enhance yields or repel insect pests in tomato, strawberry, and cucurbit crops. Red-on-black and white-on-black mulches combine yield and pest management benefits with the weed suppression of opaque films. Concerns with labor and environmental costs of end-of-season disposal have led to the development of woven fabric mulches that can be used for 8–12 years, and of biodegradable paper mulches designed to suppress weeds for one season and decompose after harvest. This article discusses the properties, weed- and other management uses, advantages, and drawbacks of a variety of synthetic mulches. Vegetable producers have used plastic film mulches for at least 40 years to prevent weed growth near the crop, and to promote crop yields and earliness by modifying soil temperature and conserving soil moisture. Unlike organic mulches, both translucent and dark-colored opaque films speed soil warming, early crop growth, and ripening. Black polyethylene and other opaque films effectively suppress a wider spectrum of agricultural weeds than most organic mulches. Easy mechanical application, cost efficient weed control, and increased crop yields have led to widespread adoption of plastic mulch by organic and conventional vegetable farmers. Disadvantages of plastic film mulch include the costs of mulch removal at the end of the season (required under USDA Organic Certification), petroleum consumption, waste generation, and the fact that plastic mulches do not build soil organic matter. A newer generation of synthetic mulches includes weed barrier or landscape fabric that lasts multiple seasons, several biodegradable mulches, and variously colored opaque or translucent films developed for specific crops or purposes. 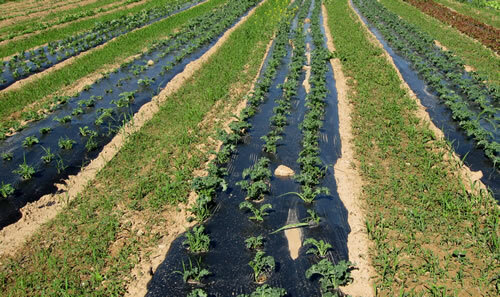 Black plastic film mulch, used in conjunction with in-row drip irrigation, is the weed management option of choice for many medium- to large-scale organic and conventional vegetable farms. The opaque film reduces germination of light-responsive weed seeds; shades out and physically blocks the emergence of most weeds; and can enhance crop growth by conserving soil moisture, promoting soil warming, and speeding nutrient mineralization from soil organic matter. The crop growth benefits contribute to weed management by enhancing the crop's ability to tolerate and compete with weeds. The most economical and widely used synthetic mulches are plain or embossed black polyethylene films, which come in various widths (4 feet is most common) and thicknesses (0.8–1.25 mil), in rolls up to 2,500 feet or more in length. Usually, the mulch is applied by a tractor-drawn mulch layer that stretches the plastic evenly over crop rows or raised beds, anchoring the edges of the mulch with soil. Warm season crops like tomato, pepper, eggplant, melon, sweet potato, and okra are often grown on raised beds mulched with black plastic, and this system is sometimes used for early plantings of onion, lettuce, brassicas, and other cool-season crops as well (Fig. 1). Normally, drip lines are installed under the film (either on or below the soil surface) to deliver moisture and nutrients (liquid organic fertilizer) directly to the crop without watering and feeding between-row weeds. Figure 1. Black polyethylene mulch blocks weeds, reduces evaporative loss of soil moisture, and warms the soil, thereby promoting growth of early plantings of many vegetables, including lettuce (a) and tomato (b). Figure credits: (a) Becky Crouse, Marketing Manager, Potomac Vegetable Farms, Purcellville, VA; (b) Mark Schonbeck, Virginia Association for Biological Farming. Can be mechanically applied to multi-acre fields with widely available equipment. Eliminates the light stimulus for weed seed germination over most of the planting bed. Blocks emergence of most weeds. Conserves soil moisture present at the time of installation or provided by drip lines under the mulch. Minimizes nutrient leaching by shedding excessive rainfall. Raises soil temperatures by a few degrees, thereby promoting early-season crop growth and maturation. Helps keep the edible portion of vegetable crops clean, especially pumpkin and other fruiting vegetables. Is manufactured from petroleum, a non-renewable resource. Does not provide organic matter to feed the soil. Does not provide as good a habitat for ground beetles, earthworms, and other beneficials as organic mulches. Does not breathe, excludes rainfall, and requires drip irrigation to ensure adequate moisture. May require manual removal of weeds emerging through planting holes. Can be penetrated by nutsedges and a few other weeds with sharp, tough growing points. Requires cultivation or other measures to control weeds in alleys. Can channel runoff and worsen between-bed erosion during heavy rains on sloping fields. Must be picked up and disposed of at the end of the season. Generates large volumes of plastic waste (200–300 lb/ac). Despite these drawbacks, many farmers use plastic mulch because it is well suited to mechanized, medium- to large-scale production. The yield increases and labor savings from using black plastic often pay for the purchase price and pickup costs several times over. Ensuring a tight fit of plastic film to the soil surface, through precise bed preparation and mulch application, improves weed control and enhances soil warming (Fig. 2). Drip irrigation is important, as laying plastic without practical means to irrigate the crop can result in moisture deficit and yield losses (Schonbeck and Evanylo, 1998). Figure 2. (a) Black plastic mulch and drip lines are laid mechanically on precisely formed raised beds to give a tight fit. (b) A single pass operation makes planting holes, sets tomato starts, and delivers liquid organic starter fertilizer. 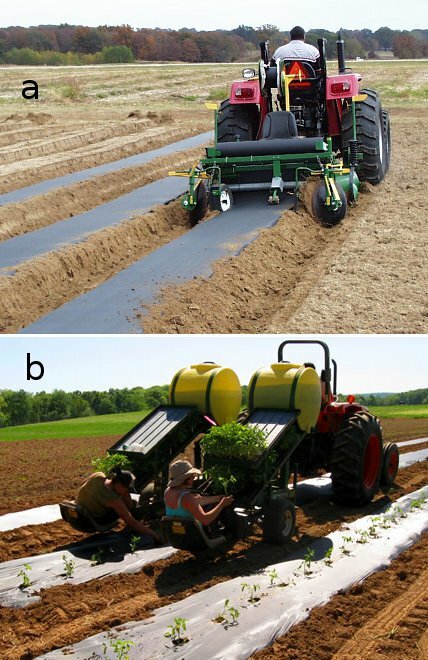 Figure credits: (a) Jim Shrefler, Oklahoma State University; (b) Becky Crouse, Marketing Manager, Potomac Vegetable Farms, Purcellville, VA.
Black plastic mulch does not eliminate all weeds. Light reaching the soil surface through planting holes and in uncovered alleys between mulched beds allows weeds to emerge and establish (Fig. 3); thus, additional measures are needed to manage weeds in these areas. Weeds in plant holes can compete severely with the crop if they are not removed early (Fig. 4a), and vining species like morning glories (Ipomoea spp.) and bindweeds (Convovulus arvensis and Calystegia sepium) grow toward the light of planting holes and climb the crop plant (Fig. 4b). Nutsedges (Cyperus spp.) and a few other weeds with sharp growing points can puncture and emerge through the film. Black plastic can accelerate the growth and spread of purple nutsedge (C. rotundus) by warming the soil (Webster, 2005). Figure 3. Weeds have begun to grow in the unmulched alleys between plastic-mulched beds. In addition, some weeds have emerged through planting holes, and a few have punctured the film itself. Photo credit: Becky Crouse, Marketing Manager, Potomac Vegetable Farms, Purcellville, VA. Figure 4. (a) Pigweed, emerged through the planting hole, is now too large to remove by pulling, and is competing significantly with the eggplant crop. (b) Ivyleaf morning glory has emerged through the planting hole, and has begun to climb the potato crop. Photo credit: Mark Schonbeck, Virginia Association for Biological Farming. Weed growth in alleys and along the edges of the mulch can be a challenge to manage. Tactics include cultivating, flaming, mowing, organic mulching, or cover cropping. Cultivation requires care to avoid cutting the mulch or pulling it loose above or below ground. Many growers apply straw, hay, or other organic mulch to the alleys and overlap it onto the plastic (Fig. 5), either at the time of planting, or after one or more cultivations. The organic mulch suppresses alley weeds, conserves soil moisture, and provides organic matter that can later be incorporated into the soil. Cover crops such as buckwheat or clover can be planted in alleys, either when the plastic is laid, or after one or more alley cultivations. At least one grower has had success with planting a ryegrass cover crop in alleys immediately after the mulch is installed, thereby eliminating the need for cultivation (Josh Hardin, farmer in Arkansas, pers. commun). 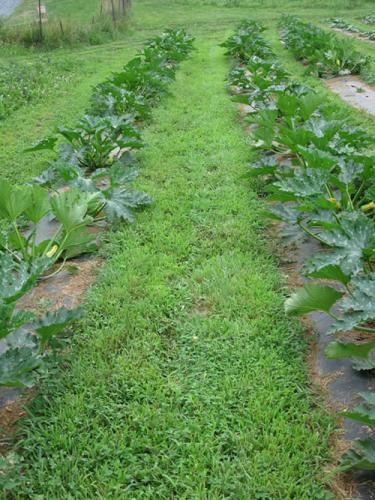 Alley cover crops can be maintained by mowing to minimize shading of the vegetable and facilitate harvest (Fig. 6). Figure 5. A thick layer of hay applied to alleys between plastic-mulched rows of eggplant has suppressed most alley weeds. With the onset of hot summer weather, some hay was moved onto the plastic to prevent excessive soil heating. Photo credit: Mark Schonbeck, Virginia Association for Biological Farming. Figure 6. A cover crop of rye and clover, planted when the plastic mulch was laid and maintained by mowing, adds organic matter, protects the soil, and facilitates access to the crop for disabled adults who work at Red Wiggler Farm in Maryland. Photo credit: Mark Schonbeck, Virginia Association for Biological Farming. Avoid using plastic in fields heavily infested with nutsedge or vining weeds. Prioritize early plantings and heat-loving crops for use of black plastic. Add organic nutrient sources and other amendments to the bed before applying plastic. 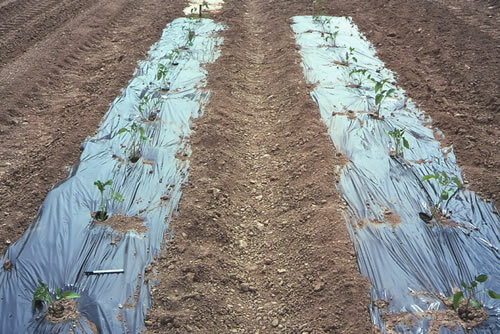 Install in-row drip irrigation tape under the film in such a way that the tape will not be damaged during planting operations (burial to the side of the row is often done). Ensure a tight fit of plastic film to soil surface to improve weed control and soil warming. Manage alley weeds through timely cultivation, mowing, mulching, or cover crops. If soil temperatures under plastic exceed optimal ranges for the crop, spread organic mulch over plastic. Clear, translucent, and infrared-transmitting (IRT) plastic films that allow solar radiation to reach the soil will warm the soil more effectively than does black plastic. However, clear colorless plastic may allow such vigorous weed growth that the mass of vegetation bulges and eventually tears the plastic. During very hot sunny weather, a tight fitting clear plastic film can heat the soil sufficiently to kill rhizomes and other vegetative weed propagules, some weed seeds, and most plant pathogens in the uppermost several inches of the soil profile. This process is called soil solarization, and is a valuable tool for preparing small areas for planting certain high-value crops. Vegetables are not normally planted into clear plastic, because the heat buildup under this mulch can damage the crop during hot weather, and accelerate weed growth during cooler conditions. Translucent green, brown, olive, and IRT (infrared-transmitting) plastic films (Fig. 7) have been developed, which combine greater soil warming (compared to black plastic), with fair weed suppression. Because they absorb the red and blue light wavelengths used by all plants in photosynthesis, and transmit mostly infrared (heat) wavelengths and some green light, these materials reduce weed germination, emergence, and growth compared to clear film or bare soil. 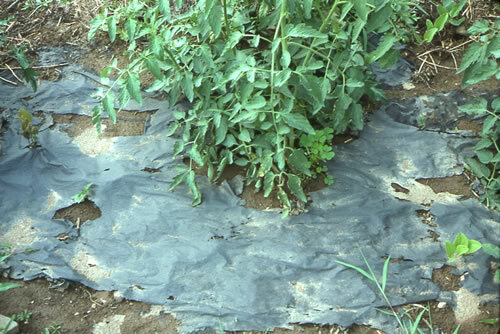 Translucent films do not control weeds as effectively as black plastic, and should be used on crops for which soil warming is critical, and in fields with light-to-moderate weed populations. Figure 7. A translucent, infrared-transmitting (IRT) film mulch promotes greater soil warming for this pepper crop without transmitting enough visible light to support rapid weed growth. Photo credit: Mark Schonbeck, Virginia Association for Biological Farming. Film mulches with white or reflective surfaces lower soil temperature compared to uncovered soil. This can benefit crop growth and competitiveness against weeds during the hottest summer months, when soil temperature under black mulch would exceed the optimum range for the crop. For example, tomato prefers moderately warm (70–85 °F) root zone temperatures and can be stressed by higher temperatures (Tindall et al., 1990); thus, farmers in warm climates often use a white mulch for later tomato plantings, or apply whitewash to black mulch when hot weather sets in after the crop is planted. Research has shown that the quality of light reflected by mulch can affect crop production (Orzolek and Lamont, 2000). Reflective (silver colored, aluminum-coated) films (Fig. 8) disorient and repel aphids, whiteflies, and some other pests. Red plastic has been reported to enhance tomato and strawberry yields by 12–20%, and dark blue plastic to improve cucurbit yields (Orzolek and Lamont, 2000). 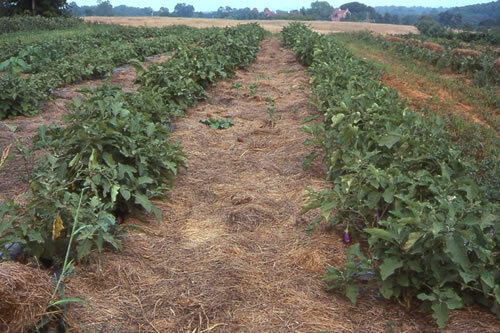 In South Carolina, red mulch was found to stimulate tomato fruit growth (Kasperbauer and Hunt, 1998), and reduce pest nematode attack on the crop (Adams, 1997). However, studies in Iowa showed no difference in tomato yield in red, IRT, and black mulches (Taber and Smith, 2000). Lack of consistency among research results suggests that the benefits of different colored mulches may vary with local conditions (climate, insect pest populations, etc. ); thus, farmers may be well advised to test specialized colored mulches on a small scale before investing in application on a larger area. Figure 8. Reflective plastic mulches. (a) A reflective, aluminum-coated, opaque plastic film suppresses weeds while also repelling aphids and other pests in this cucumber crop. (b) Reflective mulch keeps the soil cooler for pepper, eggplant, and tomato during hot summer weather than does black plastic (right background). Photo credit: Mark Schonbeck, Virginia Association for Biological Farming. White-on-black and red-on-black film mulches have been developed to combine the weed suppression of a completely opaque mulch with the yield and pest management benefits of colored mulch. Permeable to air, water, and nutrients. Opaque and durable, giving effective weed suppression. Long lasting, typically 8–12 years. Disadvantages are that the materials are relatively heavy (2.4–4.1 ounces per square yard), and expensive, although the cost is amortized over many years' use. USDA Organic Standards require that the mulch be removed from the field at the end of its useful lifespan. Some growers use woven mulches for vegetable crops (Fig. 9), reusing the same material for multiple crops and seasons. For example, Hiu Newcomb of Potomac Vegetable Farms in Vienna, VA has found this material economical for small-scale cucumber production, and picks it up for reuse as soon as harvest is complete (pers. commun.). Figure 9. 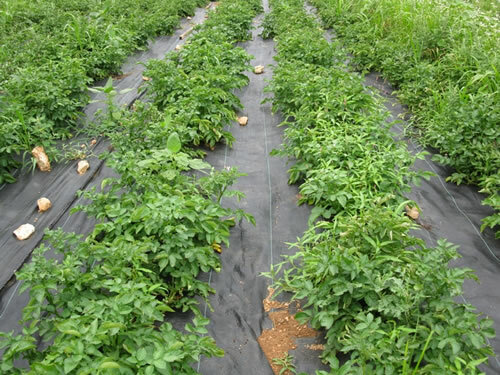 A heavy-duty landscape fabric has greatly reduced weed pressure in potato. Covering the black fabric with straw or other light colored organic material at the onset of hot weather is recommended to maintain soil temperatures favorable for potato tuber development. Photo credit: Mark Schonbeck, Virginia Association for Biological Farming. For years, researchers have tried to develop degradable plastic mulches that would eliminate the need to gather and dispose of spent, dirty plastic at the end of the season, which can entail significant costs for medium-to-large scale operations. Many growers rejected the early versions of photodegradable and biodegradable mulches, which left fragments of undecomposed mulch in the soil and thereby created a litter problem. More recently, plant-starch-based biodegradable black plastic films have been developed. These perform as well as standard black polyethylene film, and appear to decompose completely (Rangarajan and Leonard, 2007; Ngouajio et al., 2008). However, as of the fall of 2011, the USDA National Organic Program (NOP) has not yet approved these products, which contain synthetic ingredients, residues of which could remain in the soil after the mulch has broken down. Farmers and researchers have experimented with paper mulches as an alternative to plastic, with mixed results. In one study, paper mulches slightly lowered soil temperatures, and tended to tear along soil-anchored edges (Fig. 10), resulting in slightly lower yields and less effective weed control than with black plastic (Schonbeck, 1998). Since then, several commercial biodegradable paper mulch products have been approved by NOP (Organic Materials Review Institute), and have performed fairly well in field trials (Miles et al., 2007). Farmers may need to add more soil to the edges at midseason to keep the paper mulch anchored. Figure 10. In this field trial, a black recycled paper mulch product began to break down before the end of the season, allowing some weeds to emerge in the crop. Photo credit: Mark Schonbeck, Virginia Association for Biological Farming. Whereas paper alone may not always give adequate weed control, a single layer of mulch paper or several layers of newsprint under a layer of hay or other organic mulch can substantially enhance weed suppression (Fig. 11). Paper + 5 tons per acre of hay suppressed aggressive weeds like Bermuda grass (Cynodon dactylon) and common cocklebur (Xanthium strumarium) as effectively as 10 tons per acre of hay without paper (Schonbeck, 1996 and 1998). NOP allows the use of newspaper and cardboard for mulch provided that they are non-glossy and free of colored inks. Figure 11. 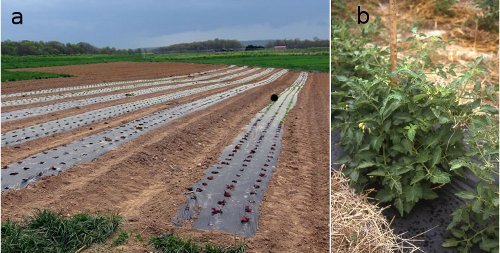 In this tomato planting in Floyd, VA (Appalachian region), a combination of several layers of newspaper plus hay mulch adequately controlled weeds, including the rhizomatous perennial quackgrass (Elymus repens), throughout the season. Photo credit: Mark Schonbeck, Virginia Association for Biological Farming. Adams, S. 1997. Red plastic mulch thwarts nematodes. News and Events. United States Department of Agriculture–Agricultural Research Service. (Available online at: http://www.ars.usda.gov/is/pr/1997/971003.htm) (verified 10 Sept 2012). Kasperbauer, M. J., and P. G. Hunt. 1998. Far-red light affects photosynthate allocation and yield of tomato over red mulch. Crop Science 38: 970–974. (Available online at: https://www.crops.org/publications/cs/abstracts/38/4/CS0380040970) (verified 10 Sept 2012). Miles, C., E. Klingler, L. Nelson, T. Smith, and C. Cross. 2007. Alternatives to plastic mulch in vegetable production systems. Research Report, Washington State University. (Available online at: http://vegetables.wsu.edu/MulchReport07.pdf) (verified 10 Sept 2012). Mohler, C. L., and A. DiTommaso. Unpublished. Manage weeds on your farm: A guide to ecological strategies. Version 5.1 (4 Dec 2008). Ngouajio, M., R. Auras, R. T. Fernandez, M. Rubino, J. W. Counts, Jr., and T. Kijchavengkul. 2008. Field performance of aliphatic–aromatic copolyester biodegradable mulch films in a fresh market tomato production system. HortTechnology 18: 605–601. (Available online at: http://horttech.ashspublications.org/content/18/4/605) (verified 10 Sept 2012). Orzolek, M. D., and W. J. Lamont, Jr. 2000. Summary and recommendations for the use of mulch color in vegetable production. (Available online at: http://extension.psu.edu/plasticulture/technologies/plastic-mulches/summary-and-recommendations-for-the-use-of-mulch-color-in-vegetable-production) (verified 10 Sept 2012). Rangarajan, A., and B. Leonard. 2007. Biodegradable mulches: How well do they work? (Available online at: www.newenglandvfc.org/pdf_proceedings/biomulches.pdf) (verified 10 Sept 2012). Schonbeck, M. W. 1996. Mulching for weed control in annual vegetable crops. Virginia Association for Biological Farming Information Sheet. Schonbeck, M. W. 1998. Weed suppression and labor costs associated with organic, plastic, and paper mulches in small-scale vegetable production. Journal of Sustainable Agriculture. 13: 13–33. (Available online at: http://dx.doi.org/10.1300/J064v13n02_04) (verified 10 Sept 2012). Schonbeck, M. W., and G. E. Evalylo. 1998. 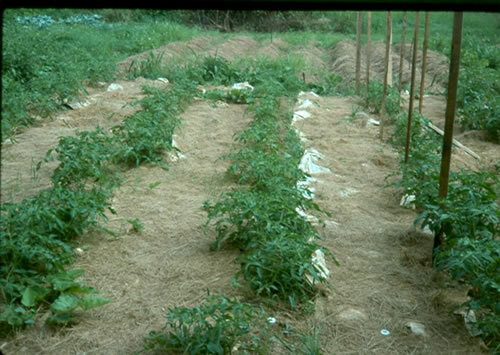 Effects of mulches on soil properties and tomato production. I. Soil temperature, soil moisture, and marketable yield. Journal of Sustainable Agriculture 13: 55–81. (Available online at: http://dx.doi.org/10.1300/J064v13n01_06) (verified 10 Sept 2012). Taber, H. G., and B. C. Smith. 2000. Effect of red plastic mulch on early tomato production. (Available online at: www.public.iastate.edu/~taber/Extension/Progress Rpt 00/redmulch.pdf) (verified 10 Sept 2012). Tindall, J. A., H. A. Mills, and D. E. Radcliffe. 1990. The effect of root zone temperature on nutrient uptake of tomato. Journal of Plant Nutrition 13: 939–956. (Available online at: http://dx.doi.org/10.1080/01904169009364127) (verified 10 Sept 2012). Webster, T. M. 2005. Patch expansion of purple nutsedge (Cyperus rotundus) and yellow nutsedge (Cyperus esculentus) with and without polyethylene mulch. Weed Science 53: 839–845. (Available online at: http://dx.doi.org/10.1614/WS-05-045R.1) (verified 10 Sept 2012).